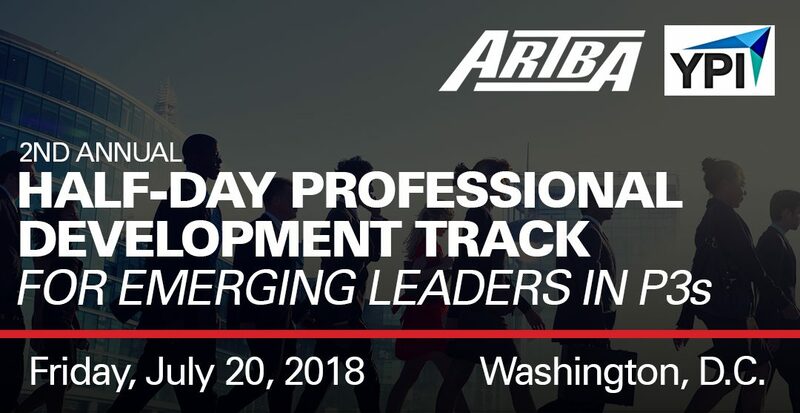 For the second year, ARTBA will host a professional development half-day track for emerging P3 leaders. It takes place July 20 during ARTBA’s annual P3 in Transportation Conference. Whether you’re just starting out in the P3 sector, have been working in it for years, or are just interested in learning more, this half-day track offers an excellent opportunity to network and hear insights from P3-oriented peers and executives, and join discussions on technology deployment, project team-building, and other pertinent industry issues. The half-day track includes a mentorship breakfast, two panel sessions, a networking coffee break, an interactive town-hall discussion, and a special luncheon for participants co-hosted by Young Professionals in Infrastructure. The registration also includes an invitation to the P3 Conference’s Networking Reception, 6 – 7:30 p.m., Thursday, July 19, at the Hyatt Regency. Visit www.artbap3.org for more details. Additional information about the program – including speakers and panelists – will be announced soon. Space is limited, so register now!